I approach Thanksgiving, my favorite holiday and perhaps plain ol’ favorite day of the year, with a no-holds-barred mentality. If it’s on the table, I’m eating it. If there are leftovers after everyone’s done, I have seconds… and then thirds. If there’s gravy, it’s getting poured on everything short of cranberry sauce. Oh and if there’s cranberry sauce, I’m eating enough to have it coursing through my veins. And there’s never ever a question of which dessert to have, because the answer is always all of them. That’s pretty much how this year’s Thanksgiving, spent with my boyfriend’s half-Florentine half-Floridian family, played out anyway. But then of course, there’s the day-after remorse. The slightly tighter waistband, the mental hazinness brought on by excessive eating, the guilt. But so help me God, if I see or even hear mention of pumpkin pie (my absolute faaaaave), I snap right out of my slump and put my game face back on. That’s what happened today when through a series of fortunate events, the pumpkin pie from Mercer Kitchen found itself in front of me. More of a mini-pie than a slice, MK’s version had a fluffy dollop of maple creme fraiche in place of whipped cream and a creamy, caramely blob of candied cashews next to it. Also on the plate, adding more autum color and taste was a rich, sticky caramel sauce (that I would like to guzzle by the mug-full, might I add) which was perfect for running forkuls of pumpkin pie through. It never fails. I could be in the depths of a profound food coma, but like sleeping salts to someone knocked out cold, my tried and true favorite, pumpkin pie, will always bring me back, because there’s always room, even if just a little bit, for more pie. 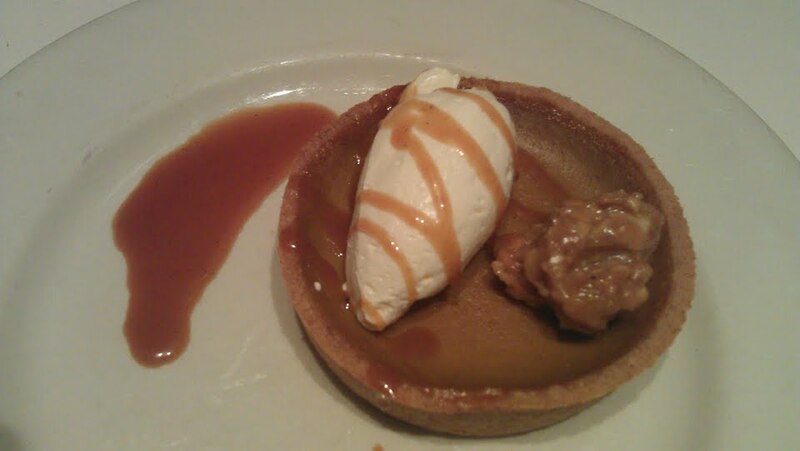 This entry was posted in Sweet stuff and tagged Mercer Kitchen, pumpkin pie, SoHo, Thanksgiving. Bookmark the permalink.